Why does 84-year-old Latiyo smile broadly? At 84, Mtaonakutha Latiyo had never tasted safe water and she does not smile about it. However, she smiles gleefully when talking about a new borehole located about 50 metres from her grass-thatched hut. 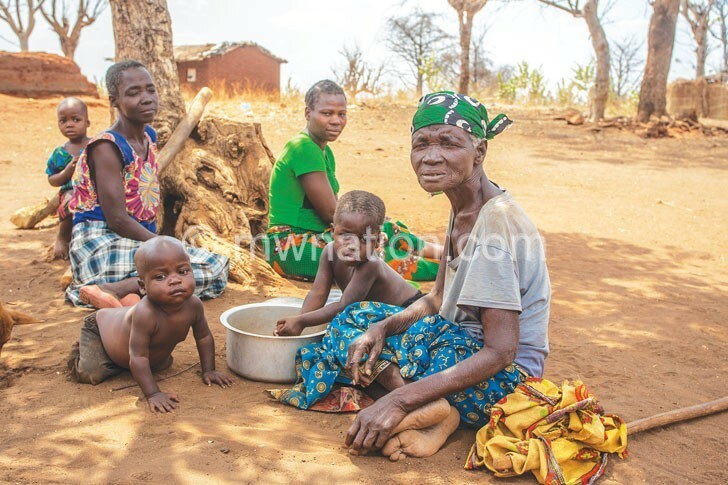 Four of her 11 children did not live to taste the clean water gushing from the pump installed by Unicef Malawi with funding from UK Aid to end cholera outbreaks in Mtenje Village on the western side of Salima District. Until this year, the rural population used to drink murky, unprotected water from Lipimbi River, nearly a kilometre from her home. “When I join my children and age mates who died when we had no safe water, I will tell them there is peace in our village. Women no longer walk long distances in search of water. Previously, we endured long walks to the river. Now, we have safe water closer to home. We are very happy,” she says, clapping hands gratefully. And she has every reason to smile. In February this year, her 35-year-old son, Kennedy Chaminju, survived cholera in an outbreak that hit two households in the hilly village. Before the outbreak, latrines were few and far apart. Many used to relieve themselves in the open. Rains used to wash human waste into the sandy river dotted with shallow wells dug using bare hands, hoes and sticks. “Water is life. Water is health. Water is sanitation. Water is everything. We thank Unicef for setting us free from one of the greatest punishments women and children endured. We had to do with the river water because that’s all we had,” she says. Now, Mtenje residents only go to the drying river to wash clothes and beddings. “The village is no longer the same. We no longer feel left behind or abandoned. How I wish the gift of water came earlier in my life. In this village, children were frequently haunted by diarrhoea, but that is becoming history because we have clean water and improved sanitation and hygiene. Water has changed everything,” she explains. She urges the villagers to take care of the borehole and enhanced sanitation and hygiene in the cholera-prone village to kick out the fast-killing disease which thrives on poor sanitation and hygiene. Latiyo’s son, a father of four, offered unsettling flashbacks of his encounters with the cholera outbreak which affected about 1 000 people and killed 30 in 13 districts between November 2017 and June last year. Narrates Chaminju: “It was a sunny Tuesday. Earlier that day, I went to sell firewood in fishing communities along Lake Malawi. On my way back, around 2pm, I bought a bottle of thobwa (sweet beer) at Siyasiya Trading Centre to quench thirst. The neighbours took him to Khombedza Health Centre where he spent 20 hours in a cholera treatment camp erected with the support of Unicef Malawi. The disease left him “too weak to buy and sell firewood” for almost three weeks, he says. That encounter with cholera has taught the survivor the importance of ensuring everyone has access to safe water, sanitation and hygiene (Wash), one of 17 targets of the Sustainable Development Goals (SDGs) to end poverty by 2030. “In life, everything depends on water. Personal hygiene, food hygiene, improved sanitation and even good health. When my mother says ‘there is peace in the village’, she means there is peace in homes,” Chaminju says. He gives a glimpse of silent “bedroom battles” as men often accused women of promiscuity because they were spending over three hours to draw water from the shallow wells that dot the contaminated river in the dry season. Better water, sanitation and hygiene practices are catalysts for the survival of children and women. In Malawi, only 15 percent of households have their source of drinking water within their premises. About half of rural households spend 30 minutes or more to obtain their water which most commonly comes from a borehole or tube well. Looking back, Chaminju recounts: “It was not uncommon in Mtenje for a jealous husband to beat his wife because he felt she was just using water shortage as an excuse to cheat on them, but their hardship was real. This demonstrates how improved access to safe water helps reduce cases of domestic violence and gender-based violence. But another remarkable saving is happening on the economic front where putting the water point closer to where people live has reduced the time women used to spend walking to the river, waiting for water to return to drying pools and climbing the hill while carrying bucketfuls of water. Some are using the time to do income generating activities. On January 25 2018, Elina Kufeyani was the first person in Mtenje Village to be diagnosed with cholera 13 years after an outbreak which affected Chaminju’s sister, Munimbanaye, along with the deceased group village headman Mtenje and several others. Said Kufeyani: “I started vomiting and experiencing a strange diarrhoea after drinking contaminated water in the river. I was too weak to walk and my neighbours and relatives took me to Khombedza Health Centre where I spent two days on treatment. “I don’t want to go back to the river. The borehole has brought a huge relief. We used to save a lot of time that we used to spend fetching water in the river and nursing the sick. Instead, we use time to do small business and take part in public life,” she says. The woman, who sells mandasi (fritters) outside her home, has enough time to attend weekly meetings of a village savings and loans group. Members of the group put together their savings and share low-interest loans for business purposes. “For me, the future looks bright. The borehole means an end to cholera and other diseases. It means more time to improve my livelihood. It means more time to work in our crop fields. It means healthy children. Previously, we were vulnerable to waterborne diseases,” she says. However, Group Village Head Mtenje, who succeeded the chief hit by cholera in 2005, urges every household to own a clean toilet with a drop-hole cover and a hand-washing facility. He states: “Every household must not only have adequate sanitation facilities but use them correctly. It is pleasing that all 76 households in Mtenje and the neighbouring Mabulekesi village have stopped drinking water straight from the river where goats, cattle and pigs drink. However, having safe water within reach cannot stop diseases if we don’t improve in terms of sanitation and hygiene,” he says. A consensus is deepening that every household must have a latrine, a facility where people can wash hands after using the latrine as well as a rack for kitchen utensils. We want to make cholera outbreaks history,” says the traditional leader. Eletina Fashoni, 35, concurs. Apart from keeping her home clean and safe for her four children, she promotes sanitation and hygiene at the borehole. The secretary of the water point management committee in Mtenje Village reckons drilling another borehole in Mabulekesi would ease pressure on the existing one and ensure it lasts longer. “Early in the morning, we find over 20 buckets in a queue as everyone wants to draw water in time to go farming. We fear for the borehole and the lives of those who cannot stand the long wait for a turn. Some people may go back to old ways of drinking water from a river where some used to defecate.” she says. Due to rising awareness about the dangers of unsafe water, many families are getting accustomed to treating water with chlorine and water guard to kill germs. “When I don’t have chlorine, which Unicef and Ministry of Health officials supply, I boil the water to avoid cholera,” says Fatima Chitseko, another Mtenje Villager. This is change in action for octogenarian Latiyo, who witnessed over 10 cholera outbreaks before she tasted safe water. The post Why does 84-year-old Latiyo smile broadly? appeared first on The Nation Online.